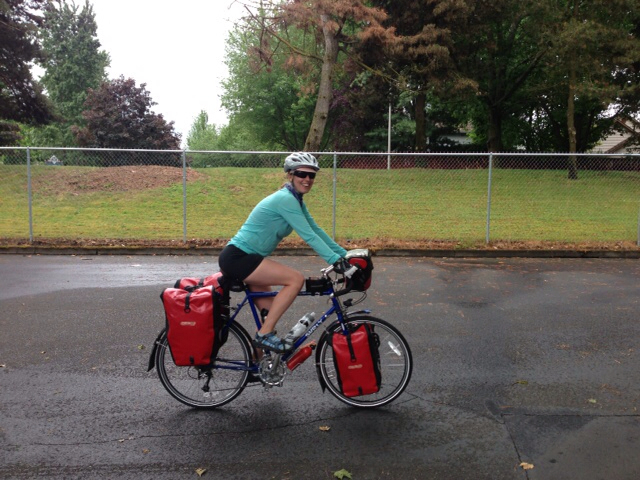 Jake served as the paparazzi and took a couple of photos before I rolled out of Portland. Me and Shirley (the Surly), in front of Phoenix. A little wobbly at first - remembering how to ride a loaded bike. 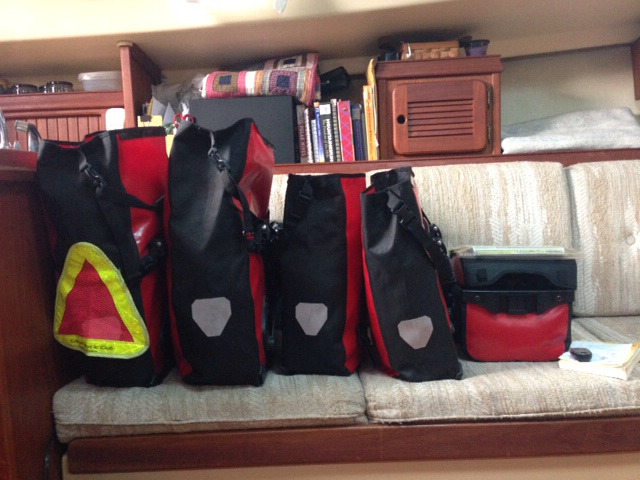 There were sprinkles falling from the sky when I first looked out the companionway this morning. The weather surely wasn't screaming, "It's day #1 - get up and ride!" 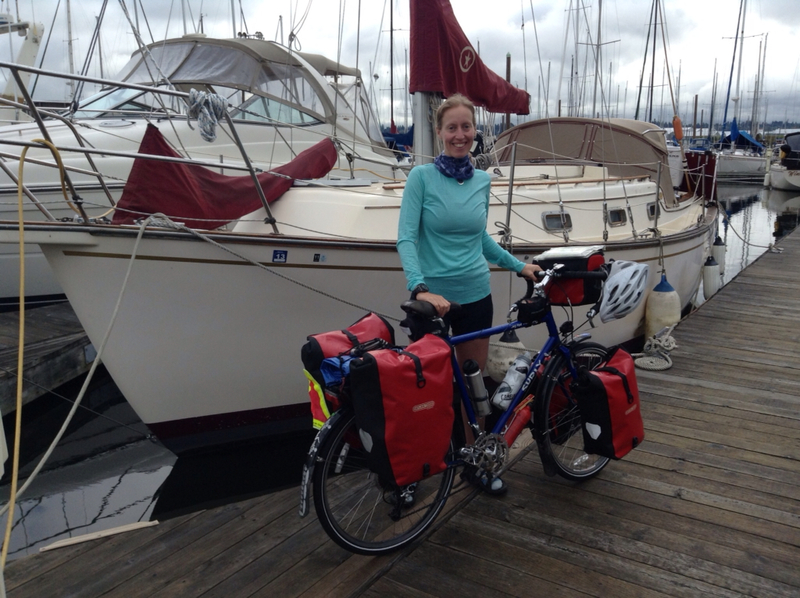 Fortunately, the rain had stopped by the time I set out from the marina. Of course, I didn't get more than a few miles away when the moisture set in again. It tinkled on-and-off throughout the day, punctuated by moments on sunshine. To be honest, the little droplets were refreshing at times. About 8 miles outside of Portland, an older biking gentlemen seated on the side of the path asked me for the time. When I told him that my watch indicated a few minutes after 10am, he expressed shock and shared that he had just broken a record for the fastest bike ride. Troy J Stewart is 71 years of age and rides a 1971 Schwinn. 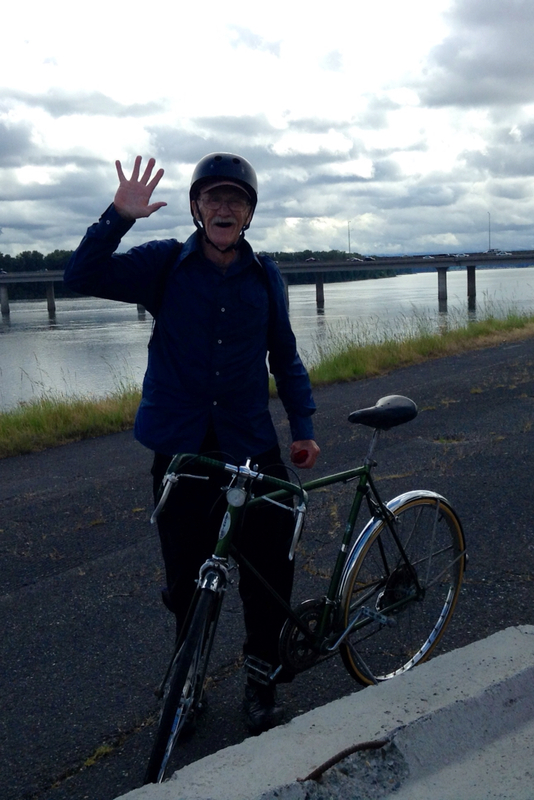 He told me that he had been riding since 7:30 this morning from his home in Sellwood. Indeed, impressive time! Troy J Stewart is twice my age. I asked him what advice he would give me to help me live a long, happy life. He said his advice would be to stay active in order to stay healthy. Despite numerous surgeries, including a recent hip replacement, Troy tries to get out on his bike regularly. On the days he is unable to get out for a ride, he sits at home in his chair, which causes him to quickly get achy muscles and bones. Great advice. Though, I will admit that sitting on a bike for 70 miles without any training has also given me achy muscles and bones. I suppose it's a good kind of achy, though - one that makes you stronger and healthier and that hopefully leads to a longer, happier life. The route started getting truly beautiful once I arrived in Troutdale, and I began riding along the Historic Columbia Highway in the Columbia Gorge. The view from Portland Women's Forum. There were waterfalls everywhere! 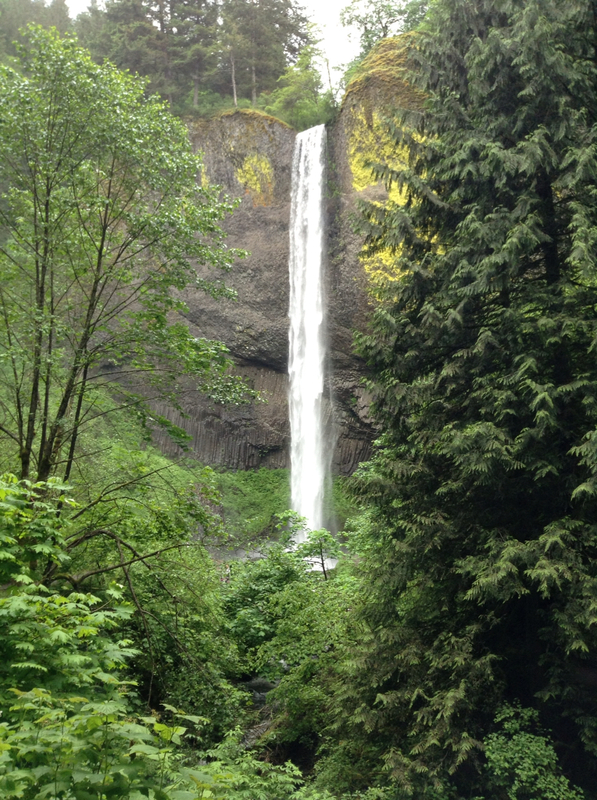 Some are well known, such as Latourell, Bridal Veil, and Multnomah Falls. Others were just unnamed falls, tucked away in the woods. One of the things I love about cycling is being able to notice sounds and sites that you can't detect when you are speeding by in an automobile. I wonder if the folks in the cars noticed all of the waterfalls I saw. 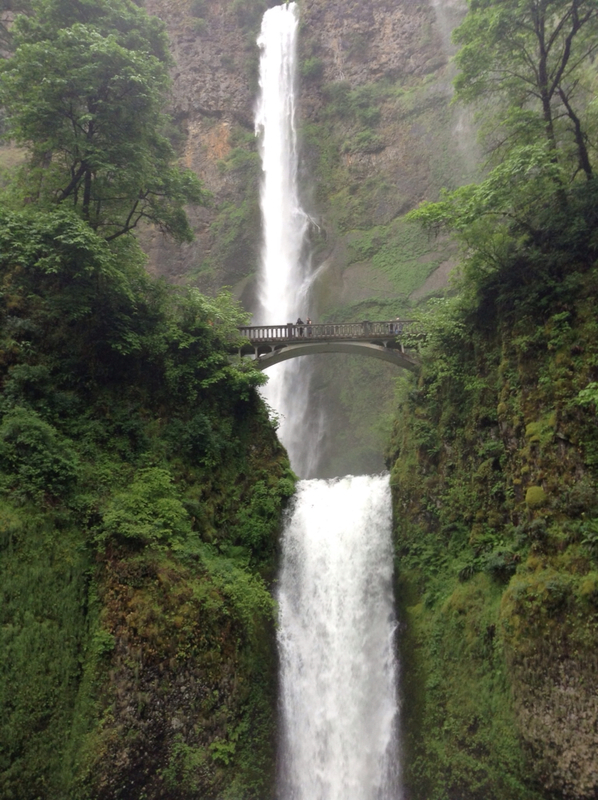 I'm convinced that many of these waterfalls were made for bicyclists' eyes only. 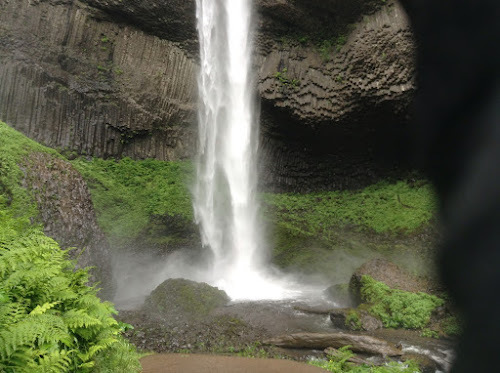 I totally wanted to take a bar of soap under the falls, though I'm sure this falls would have knocked me down. The mostest gorgeousness of the falls - Multnomah Falls. The route today was on a couple of different types of roads. 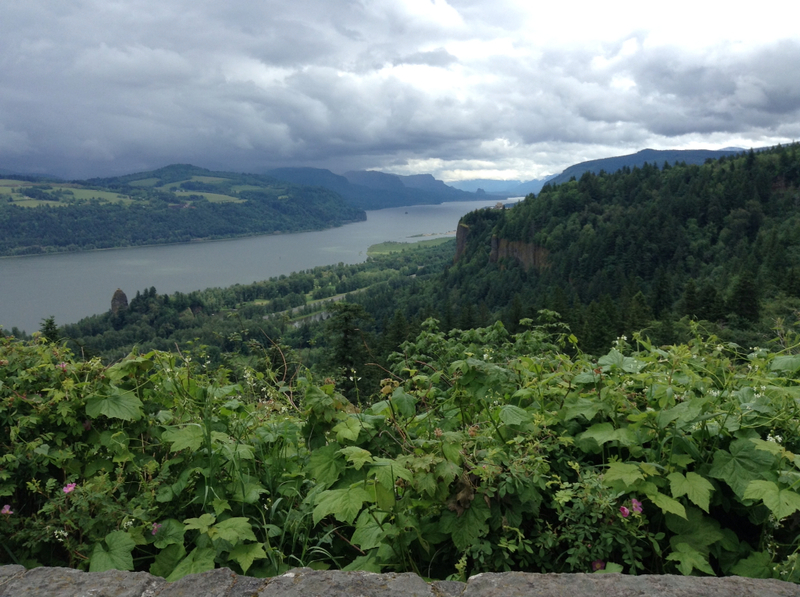 There was The Historic Columbia River Highway, which was winding, low-traffic, and gorgeous as can be. 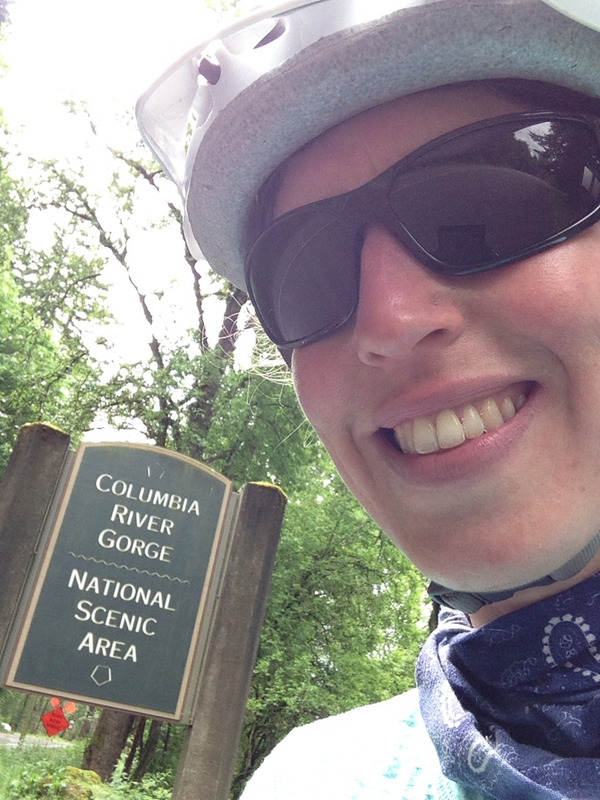 There was the Historic Columbia River Highway State Trail, which was a pedestrian and bicycle-only trail. Loved riding on this! And then there was Highway 84. The highway wasn't as bad as anticipated - the shoulder was a car-width wide, and the road was as flat as a pancake. 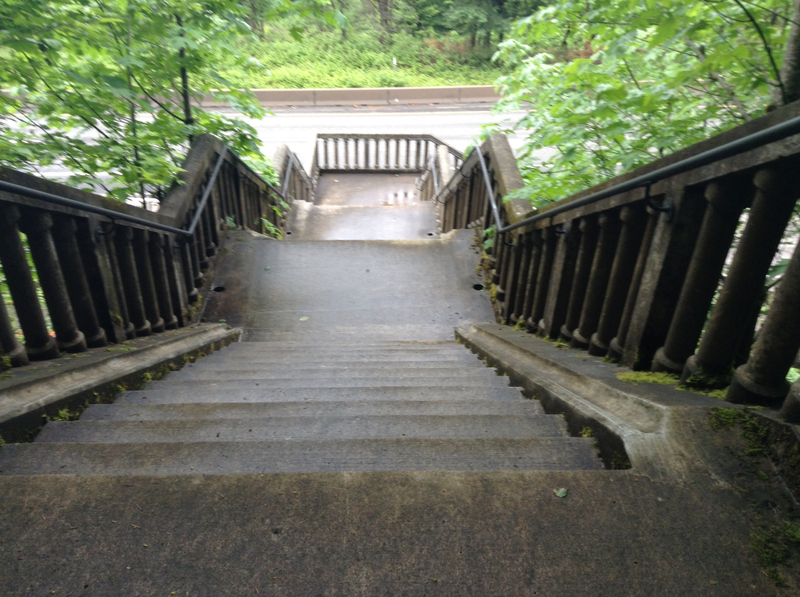 My map warned me that at one point along the bike trail, I would come upon a stairwell equipped with a bike-wheel groove. I was figuring this stairwell would have been constructed with bike-friendliness in mind. You know...so that you could easily roll your loaded bike up or down the stairs. No freakin' way. Not only did I need to remove all the panniers and carry those separately down the stairs, but I also ended up needing to carry my bike, too. With the load off my bike, I tried rolling my bike down one set of stairs using the provided groove. The groove was super steep and super slippery. Squeezing the hell outta my brakes did not do the job. 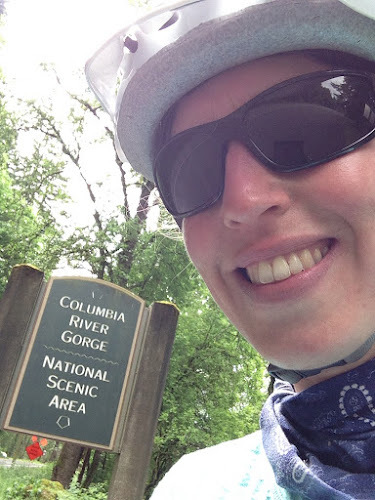 For some silly reason, I was under the impression that I was only riding ~50 miles today. This low mileage was comforting given that I did not get a single moment of shut-eye last night. I tried, but I was just too excited to sleep! (Think little-kid-the-night-before-Santa-arrives excited.) At my lunch stop today, it dawned on me that I should double-check my itinerary. Good thing I did, as I actually needed to ride just over 70 miles today to get to Hood River, where I scheduled a Warm Showers host. My friend, Cassie, is good at turning me onto things. As I mentioned in a prior post, Cassie turned me on to cookie butter. She also turned me on to front hub generators and Warm Showers. WarmShowers.org is to cyclists as CouchSurfing.org is to other travelers. The site enables "reciprocal hospitality" for cyclists. 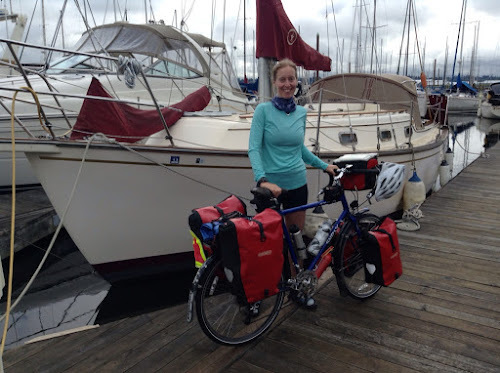 If you are willing to host cycle tourists in your home (providing a minimum of a warm shower, but also a bed to sleep in or a place to pitch a tent, and perhaps a meal and a place to do laundry), then you offer your hospitality by creating a simple profile on the site. In turn, you can search the profiles to find a person who will host you. I plan on staying with a few Warm Showers hosts on my trip and camping the other nights. After spending many nights in a tent and showering in public bathrooms, staying with a host is a nice change of pace. More importantly though, I like learning about people - their experiences with biking and touring and the interesting guests they host from around the world. Ross was my host in Hood River. He was great. He offered a spare bed (I slept like a baby), and he cooked a fantastic meal - pasta with vegetables, a spinach salad, and bread. It definitely hit the spot. After completing a recent business deal, Ross is taking the year off to enjoy life. He is doing a number of awesome trips this year, including rafting the Grand Canyon and biking over in Europe. He bought an empty van and is in the process of converting it to a little travel mobile that can fit bikes in the rear. How fun! All in all, twas a great first day of biking. I'll admit, the 70 miles was a little rough at times. As I mentioned in a prior post, I haven't been biking much in preparation for this trip. 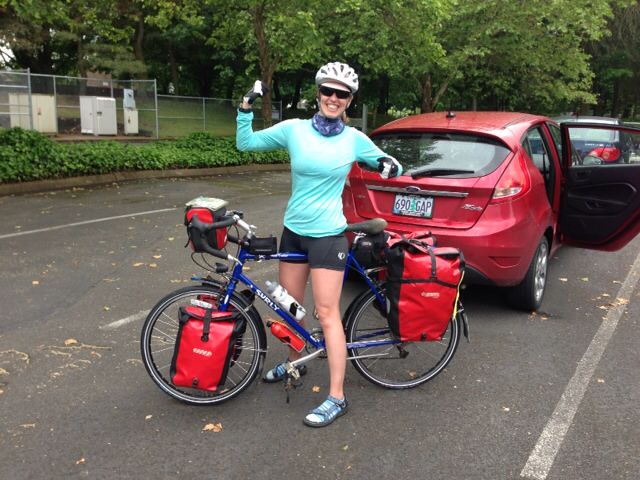 And so hauling 70 pounds (bike plus gear) 70 miles over hilly terrain was definitely a good test of endurance. I look forward to getting stronger each and every day. Awesome first post! Can't wait to hear more :) So many trips seem to start with "Well, it was raining on the first day..."
Thanks, Andy! I can't wait for you to begin your ride. I'm hoping we can meet up for breakfast in Minneapolis and perhaps cross paths on the way to NY.